Family: I’m married and also have two awesome basset hounds and a cat! Music interests: Buddy Guy, Avett Brothers, Pixies, Warren G, 2pac, George Clinton and much much more! Philanthropy: I love giving my time to anyone that needs a helping hand! 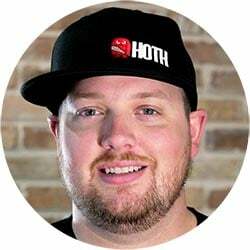 I started at The HOTH in 2016 as a customer success specialist. My role as was to provide a small business feel and experience to all our customers. I have since moved onto become an Account Manager helping our clients maintain and manage their personal goals and aspirations for all of their accounts. My SEO Philosophy: Content and Diversity is what I like to preach! Helping my clients understand that SEO is not just about keywords anymore and is about having a tactical approach is huge. Having an awesome insightful blog that can be shared across your social media platforms is a great way to engage your current customers and source new ones as well!